Everyone needs a pretty scissor case to hold your scissors, especially the special ones. These pretty floral cases keep your special scissors hidden from those who are looking for a pair of scissors to use on things they shouldn't. 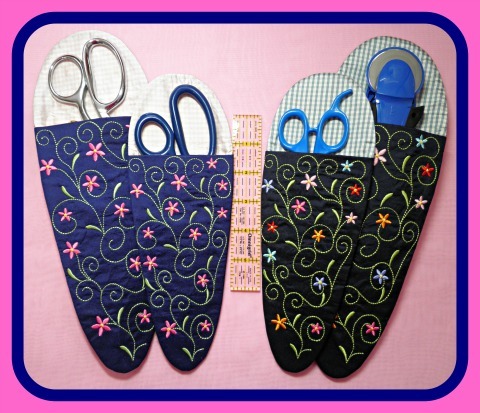 In this scissor case set, you will have a scissor case that will fit a 7” and 8” pair of scissors or some rotary cutters. And MANY other things. Plus a cute matching scissor fob to mark your scissors and keep pins handy. Choose from a multi-color floral design or keep it simple with all flowers the same color and you will love each one. Full color step by step instructions are included in a pdf file. Made completely in the embroidery hoop, the scissor cases fit in a 6 1/4" x 10 1/4" hoop for the large set and 7" x 11 3/4" hoop for the Extra Large set. The scissor fob fits in the 4" x 4" hoop. mb_lg_floral_sc_back - 152.5 mm x 250.1 mm OR 5 5/16" x 9 3/4"
mb_lg_floral_sc_front - 110.5 mm x 199.1 mm OR 4 5/16" x 7 3/4"
mb_xlg_floral_sc_back - 178.4 mm x 294.1 mm OR 6 15/16" x 11 7/16"
mb_xlg_floral_sc_front - 128.5 mm x 232.2 mm OR 5" x 9 1/16"
mb_floral-scissor_fob - 63.7 mm x 69.7 mm OR 2 7/16" x 2 11/16"
Please make sure the designs fit in your hoop before purchasing. If you are looking for the small case set, click here. If you want a deal on both sets combined, click here.